I, first tasted falafel in Amsterdam, Netherlands at a street shop selling falafel sandiwches. Right then and there, I got hooked to it for many reasons. Firstly, and most importantly, it was completely vegetarian and tasted delicious. You could have it just as a snack with humus or make it into a sandwich or wrap. I also learned that the main ingredient was chickpeas, in form that I had never seen or used before. 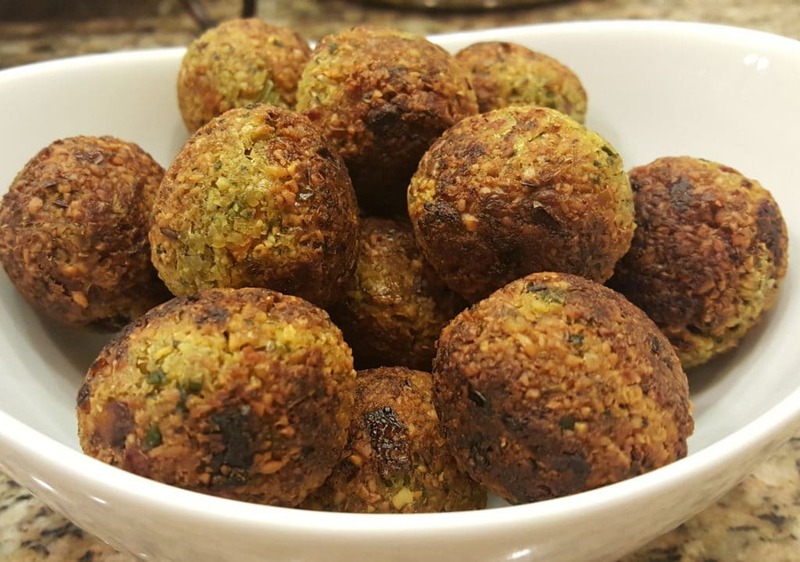 Chickpeas, being a main ingredient, make these falafels protein and fiber rich. The street shop in Amsterdam, made them by deep-frying, which I did not mind at all in January’s cold weather. Some times you just need calories with good taste in cold winter months. However, when back home, I wanted to relish the same taste in a healthier manner, if possible. Hence, I tried making these falafels using appe pan or ebelskiver pan. This was one of the first recipes I made using appe pan, which was until then just sitting in one kitchen shelf. Also learnt that you can make falafel using different kind of chickpeas, i.e. white chickpeas (chole), black chickpeas (kala chana) or green chickpeas (hara chana). 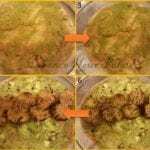 I have tried all different version in my kitchen and they all taste great. I will shortly update this recipe with other versions as well. Humus is the most common accompaniment for falafels, which is also made from chick peas. I also sometime enjoy these with cilantro mint green chutney. To make a wrap, you can use my avocado chapatis or any other version of Indian flat breads you prefer. This recipe can also be prepared during Indian Culinary Experience, when you join it. Just let me know in advance! Chickpeas/Garbanzo beans (chole) – 1/2 cup dry washed, soaked overnight and drained. Rice flour acts as a binder in this recipe. 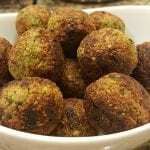 Above ingredient quantities will yield about 25 falafels, which makes 5 to 7 servings. Process the chickpeas, parsley, cilantro, ginger and green chilies in a food processor using chopping blade until rough coarse texture don’t over process into a paste. Once the mixture reaches the desired consistency and texture, pour it out in a mixing bowl and add chopped onions, salt, black pepper, roasted cumin powder and lemon juice and mix it to incorporate all the ingredients nicely. If you want at this point you can refrigerate the mixture for couple of hrs, I didn’t keep and right away made the round balls from it. Size of balls depends upon the cavity of your appe/ebelskiver pan. Heat the appe/ ebelskiver pan on a medium low heat and grease all the cavities using little oil. Put one ball in each cavity, no need to cover the pan. Once done and golden brown from bottom flip them with the help of spoon and add little more oil from the sides, if you see the sides are not getting brown flip them again so that they should be golden brown and cooked from all sides. 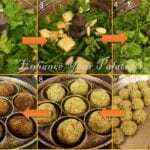 Repeat the process with the remaining falafel balls and serve them with tahini or hummus. You can also use these falafels for rolls / wraps using Avocado chapatis or other flat breads to make it easy for kids to eat or take in lunch. Another successful experiment falafels in appe pan, even better than deep fried once . 1 cup Chickpeas Dry washed soaked overnight and drained. You can also use these falafels for rolls / wraps to make it easy for kids to eat or take in lunch. Hey Pretti, Thank you for your interest. You can do email subscription to the website to get updates anytime a new recipe is posted or you can follow me on one of the social media platforms. I am most active on Facebook & Instagram. Just click on the ‘Facebook’ icon in the website and it will take you right there.